“The social earthquake of 2011, the student movement, is becoming a political tsunami. We see it in the rise of new leaders and different visions,” said Noam Titelman, the president of the Student Federation of the Catholic University. One symptom of this “tsunami” is the growing politicization of movements. 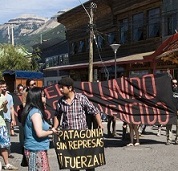 In effect, the growth and solidification of the social movement over the last decade exploded in 2011: strikes and regional protests in Magallanes (south), Arica and Calama (north), a local uprising against the HidroAysén mega-project (south), copper workers strikes, Mapuche community actions, mobilizations of earthquake victims in 2010 and, above all, the broad-based movement for public education that includes students, parents and teachers. In mid-2011, at the height of the student turmoil, the third Historians’ Manifesto asserted the emergence of a “movement of revolutionary-anti-neoliberal character.” In 2013, after two years of intense mobilizations and increased electoral abstentions, numerous analysts have noted and agreed that the political class was getting nervous, paving the way for a proposal to call a Constituents’ Assembly, which historian Sergio Grez pointed out, was taking the democratic route to a “fundamental overhaul of its institutionalization” for the first time in Chilean history. The current movement rejects the Coalition of Parties for Democracy strategy, consisting of a centrist coalition which governed Chile between 1990 and 2010, that gradually dismantle the legacy Constitution. In fact, this process was halted due to the so-called “catches,” which serve to resist reforms, as is the case with the education law that was likewise inherited from Pinochet. They are arriving at the El Manzano prison in the outskirts of Concepción, after crossing pine ridges and forests of the eucalyptus trees that survived initial timber extraction enterprises. The delegation, after announcing its intention to visit Héctor Llaitul and having passed through three Gendarme controls, not very formal for sure, continued on to the penal sanctuary. Seated on his bed, surrounded by his wife, mother, and family members of two other prisoners, Llaitul smiles in a warm greeting. The commission includes five important national figures, the president of the Evangelical Lutheran Church, the president of the Medical College, a former judge and diplomat, student and union leaders, several intellectuals, the Mapuche pastoral, and the Ethical Commission against Torture. Half of the delegation went to the Angol prison, where Ramón Llanquileo is being held, who, like Llaitul, is a member of the Arauco Malleco Coordinating Committee, dedicated to the recuperation of ancestral lands that are now in the hands of forestry companies and large estate owners. The Mapuche prisoners ended their 76-day hunger strike on January 28 when the delegation resolved to form a National and International Commission of Mapuche human rights observers. Llaitul had a cheery disposition despite having lost 26 kilos, notable in how his pants were sagging and in the pallor of his face. The motives for the strike are plenty, but the visitors received flyers with only six demands listed. The six demands were: the immediate release of Llaitul and Llanquileo, to open a dialog between the State and Mapuche representatives, to establish an agenda that “takes into consideration the self-determination, forms of representation, and self-government of the Mapuche people,” to take back territories now in the hands of forestry companies, to drop all charges against the Mapuche prisoners, to respect Convention 169 of the ILO (International Labor Organization), which recognizes the collective rights and protects Mapuche children, as many children in the community have been negatively impacted by repressive state institutions. The Fourth Declaration of Historians in Respect to the National Mapuche Question, signed by hundreds of intellectuals, was distributed days after the the Swiss settler couple Luchsinger-Mackay were in Vilcún, on January 3, when Mapuche community members tried to occupy their property on the fifth anniversary of the assassination of Mapuche community member Matías Catrileo, who was shot in the back by police when a group attempted to enter the hacienda belonging to Jorge Luchsinger. The 2012 elections changed the whole electoral procedure. Before, voters had to register in order to vote, but only 8 million out of 13 million eligible voters showed up on the voter rosters, since the majority of youth refused to register. This time, voter registration was automated, but the amount of people who didn’t vote was greater than those did not register: nearly 8 million voters did not show up at the polls and five million voted, meaning that three million more abstained. Now, many politicians are debating whether to rule voting mandatory. Mario Sobarzo of “Alarm Center;” or Centro Alerta in Spanish, a collective known for its campaign it waged against the urban transport system Transantiago, reflected on the 60% voter abstention rate, and reminded citizens of the low 30% registered voter turn-out in the country’s most impoverished communities, like the periphery of the capital, Puente Alto. In this community, the Transantiago is affected by the highest fare evasion rate, on average of about 20%. Despite posting fare monitors at every station and on all the buses, one out of every five riders do not pay, even at the risk of being sanctioned with elevated fines. High school students grouped under ACES, the main nucleus of the most mobilized sector in Chilean society, continue to amass between 45 and 65 high schools according to Manuela and Max, reminding that at the height of the conflict, the group coordinated 120 out of 200 occupied high schools. They believe that the movement is far from being neutralized and that weekly assemblies have deepened their understanding of the Chilean reality. In addition, they sought to “join together the centers of conflict,” leading to the formation of a Mapuche Commission in ACES for the purposes of building direct ties to the communities affected by the repression. The type of relationship the high school students are establishing with the Mapuche seeks to build direct ties between the two movements without regard to government authorities, entities that the movements reject. In the last two decades, several student Mapuche groups linked to urban university student residences have emerged, and have taken on significant roles as centers of the organizing the Mapuche. The large-scale student mobilization of 2011 was up against a wall of government indifference, despite the fact that the youth movement enjoys more sympathy than President Piñera. Rough waters disperse but they don’t dissolve. Rather they return with greater force, seeking lateral side paths. In Chile, there are two converging processes: the social protest is legitimized and has been growing for a decade, putting the regime, not just the government, into question. We are calling this duality tsunami, along the lines of what the president of the Student Federation of the Catholic University, Noam Titelman, expressed: “The social earthquake of 2011, the student movement, is becoming a political tsunami. We see it in the rise of new leaders and different visions.” One symptom of this “tsunami” is the growing politicization of movements. Let’s examine two cases. They believe that the great virtue of the movement has been to put up for debate the main tenets of the existing model, such as the assumption that education is a luxury. They also speak of themselves: “We are at the tip of the iceberg, on the margins of a social continent that has had enough of abuse, brutalization, blows, humiliation, and exploitation.” The clarity of the youth’s analysis, and above all, their decisiveness and fearlessness, is underlined in every gesture and every word, in how they dress and speak, and in their critical and challenging gaze. It is the same gaze seen in Llaitul and the family members of the Mapuche political prisoners. For Salazar, the Mapuche “are a movement that has accumulated its own historical memory, almost unparalleled in the world, of not just one but five to six phases of war over more than six centuries.” They embody a different political culture than the traditional, and, upon closer glance, it is similar to the student movement: they are not beholden to the existing Constitution, nor do they form a political party, nor do they adhere to the election cycles, nor do they compete for government posts, nor do they assimilate into the political class. Furthermore, “they do not set fixed agendas, single objectives or rigid dogmas subject to constant re-evaluation.” They have a novel form of analysis and understanding of their past and of the country’s current reality. The Mapuche’s historical record is rich, and every militant is keenly aware of the root of the problem; the “the pacification of the Araucanía” comes up in every debate. It is not a coincidence that these after years of abuse by the neoliberal system and by the Chilean State, both movements are beginning to come together, venturing down the same paths that they never left, but only submerged for the time being to replenish their strength, resurfacing with more knowledge and courage than before with the potential to erupt … a tsunami. Asamblea Coordinadora de Estudiantes Secundarios(ACES), “Propuesta para la educación que queremos”, La Revista Otra, MPL, Santiago, 2012. “Cuarta Declaración de Historiadores respecto de la Cuestión Nacional Mapuche”, La Araucanía-Santiago, 19 de enero de 2013. Gabriel Salazar, “Movimientos sociales en Chile”, Uqbar, Santiago, 2012. Sergio Groz, “Chile 2012: el movimiento estudiantil en la encrucijada”, Le Monde Diplomatique, edición chilena, enero-febrero de 2012. Raúl Zibechi, intercambio con movimientos sociales, Santiago, 28 de enero de 2013. El Ciudadano, 2 de noviembre de 2012. Le Monde Diplomatique, enero-febrero 2012. Le Monde Diplomatique, ob. cit. Gabriel Salazar, “Movimientos sociales en Chile”, pp. 116-125. The first era of the war was against the Incas, the second and third against the Spaniards, the fourth was the defeat in the “pacification of the Araucanía,” the fifth was the century-long retreat, and the sixth, the current era, is the “rebirth” of the movement. El Ciudadano, 31 de octubre de 2012. El Ciudadano, 1 de noviembre de 2012. “La revista Otra”, MPL, 2012, pp. 43-50. Gabriel Salazar, “Movimientos sociales en Chile”, ob. cit. p. 119.